آزادی, مجید, صوفیانی, محمد رضا, وکیلی, غلامعلی, قائمی, هوشنگ. (1395). مطالعه موردی اثر گوارد داده‌های ایستگاه‌های دیدبانی و جوّ بالا بر برون‌داد بارش مدل WRF روی منطقه ایران. 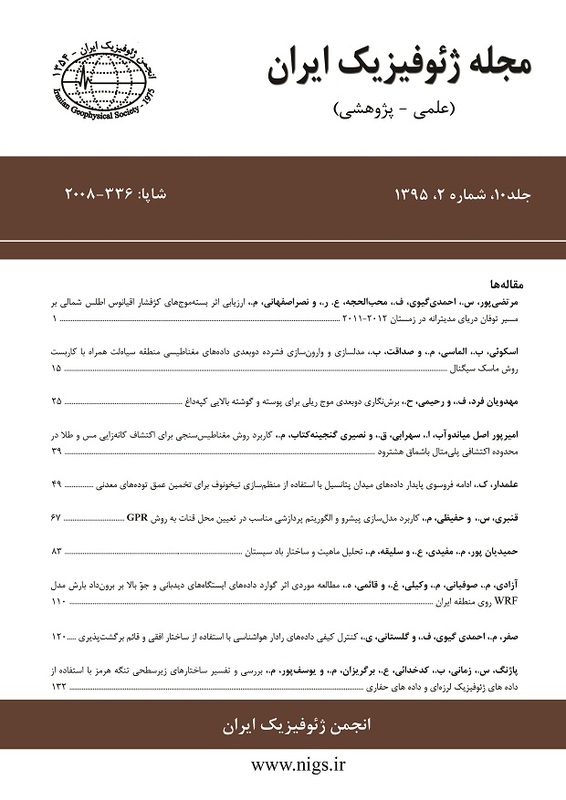 مجله ژئوفیزیک ایران, 10(2), 110-119. مجید آزادی; محمد رضا صوفیانی; غلامعلی وکیلی; هوشنگ قائمی. "مطالعه موردی اثر گوارد داده‌های ایستگاه‌های دیدبانی و جوّ بالا بر برون‌داد بارش مدل WRF روی منطقه ایران". مجله ژئوفیزیک ایران, 10, 2, 1395, 110-119. آزادی, مجید, صوفیانی, محمد رضا, وکیلی, غلامعلی, قائمی, هوشنگ. (1395). 'مطالعه موردی اثر گوارد داده‌های ایستگاه‌های دیدبانی و جوّ بالا بر برون‌داد بارش مدل WRF روی منطقه ایران', مجله ژئوفیزیک ایران, 10(2), pp. 110-119. آزادی, مجید, صوفیانی, محمد رضا, وکیلی, غلامعلی, قائمی, هوشنگ. مطالعه موردی اثر گوارد داده‌های ایستگاه‌های دیدبانی و جوّ بالا بر برون‌داد بارش مدل WRF روی منطقه ایران. مجله ژئوفیزیک ایران, 1395; 10(2): 110-119. مسئله پیش‌بینی عددی وضع هوا یک مسئله مقدار مرزی-اولیه است. بنابراین، پیش‌بینی نیازمند دانستن شرایط اولیه جوّ است که البته باید بهترین برآورد ممکن از حالت جوّ باشد. مدل‌های منطقه‌ای پیش‌بینی عددی وضع هوا دارای خطاهایی هستند که بخشی از این خطاها ناشی از عدم قطعیت موجود در شرایط اولیه مدل است. در این مقاله که حاصل یک کار پژوهشی محدود است، تلاش می‌شود تأثیر استفاده از داده‌های دیدبانی سطح زمین و جوّ بالا از طریق فرایند داده‌گواری به منظور برآورد بهتری از شرایط اولیه جوّ و در نتیجه پیش‌بینی نشان داده شود. روش کار به این صورت بوده است که مدل عددی WRF (Weather Research and Forecasting) برای چهار سامانه بارشی برگزیده یک بار با استفاده از داده‌گواری و بار دیگر بدون استفاده از آن اجرا و برون‌داد هر حالت تا 72 ساعت به‌طور متناظر مقایسه شده است. نتایج نشان می‌دهد داده‌گواری تأثیر مطلوبی بر برون‌داد بارش داشته و پیش‌بینی آن را بهبود داده است. از نظر کیفی و با روش درستی‌سنجی چشمی، الگوی بارش با استفاده از کشانش (nudging) شباهت بیشتری با الگوی بارش واقعی دارد. درستی‌سنجی آماری نیز که با استفاده از شاخص‌های ME و MAE (میانگین خطا و میانگین مطلق خطا) انجام شده است، نشان می‌دهد که مقادیر شاخص‌های ME و MAE در حالتی که کشانش به‌کار رفته، به‌ترتیب به‌طور میانگین نسبت به حالت بدون کشانش، 18 و 15 درصد کمتر شده است. Numerical weather prediction is an initial-boundary value problem. Hence, to estimate the future state of the atmosphere, its current state with as much accuracy as possible should be known. Part of the error in the outputs of limited area models is due to the imperfect initial conditions. Many researches have been conducted to develop various methods for improving the accuracy and quality of the initial conditions. At the time being, operational weather forecasting centers combine short-range weather forecasts and available observations using statistical methods to provide the initial conditions. This approach is known as data assimilation, whose purpose is defined by Talagrand (1997) as “using all the available information, to determine as accurately as possible the state of the atmospheric (or oceanic) flow.” In general, there are two strategies for data assimilation; intermittent and continuous approaches. In the intermittent approach, some sort of analysisschemes, such as successive correction, optimum interpolation or 3-dimensional variational (3D-VAR) is used to combine a short-range forecast as the background field with observations. The new analysis is then used as the initial condition of the model which is integrated forward in time. The resulted forecast may be used as the new first-guess for the next analysis. The analysis time intervals for such schemes typically range from 1 hr to 12 hrs. Disadvantages of such schemes, especially in the mesoscale, include analysis balance constraints, model spin-up, data sparseness, and data usage constraints. In continuous assimilation methods, on the other hand, one is able to assimilate observational data at its valid time, and produce smoothly varying model fields in all 4 dimensions. Due to the time-continuous aspect of such scheme, the model spin-up problem could be eliminated, and all available observations are used at their valid time. Since the model adjusts dynamically; inappropriate larger scale balances are not imposed. Examples of continuous assimilation methodologies include 4-dimensional variational (4DVAR) methods and Newtonian relaxation of observations called “observation nudging”. The former is expensive computationally and may not be feasible for real-time or operational assimilation systems. The Newtonian relaxation technique is described well in Stauffer and Seaman (1990), including the differences between analysis nudging and observation nudging. Analysis nudging is often considered to be a continuous assimilation method because the analyses are nudged into the model continuously over time. However, the analysis itself is a one-time product and thus analysis nudging has many of the disadvantages associated with intermittent assimilation schemes, including data sparseness and balance issues. One of the main disadvantages of observation nudging schemes is that the observations must be of a model variable, or directly convertible to one. Indirect observations, such as satellite-measured radiances, cannot be assimilated via observation nudging. In this paper, it is attempted to assimilate surface and upper air observations over Iran to estimate the initial condition of the model and prepare predictions with higher accuracy. The WRF mesoscale model was run for four selected cases to produce 72-h weather predictions with and without data assimilation. The model outputs are compared against corresponding verifying observations. Results showed significant improvements in precipitation forecasts when data assimilation is used, such that forecasted precipitation patterns look more similar to the observed ones. Also, calculated statistical verification scores showed around 18 and 15 percent improvement in the mean error (ME) and mean absolute error (MAE) respectively. صفر، م.، احمدی گیوی، ف.، و محب­الحجه، ع.ر.، 1391، بررسی اثر گوارد داده­های رادار در مدل عددی ARPS در شبیه­سازی بارش حاصل از سامانة همدیدی 31 مارس 2009 در منطقه تهران: مجله ژئوفیزیک ایران، 6(3)، 94–112. Davalio, S., and Buzzi, A., 2004, A nudging scheme for assimilation of precipitation data into a mesoscale model: Wea. Forecasting, 19, 855–871. Gallus Jr., W. A., and Bresch, J. F., 2006, Comparison of impacts of WRF dynamic core, physics package, and initial conditions on warm season rainfall forecasts: Mon. Wea. Rev., 134, 2632–2641. Liu, Y., and co-authors, 2005, Implementation of observation-nudging based FDDA into WRF for supporting ATEC test operations: 2005 WRF Users Workshop, Boulder, Colorado, June 2005. Lorenz, E. N., 1963, The mechanics of vacillation: J. Atmos. Sci., 20, 448–465. Michalakes, J., Chen, S., Dudhia, J., Hart, L., Klemp, J., Middlecoff, J., and Skamarock, W., 2001, Development of a next generation regional weather research and forecast model; Developments in Teracomputing: Proceedings of the Ninth ECMWF Workshop on the Use of High Performance Computing in Meteorology, 269–276. Osuri, K. K., Mohanty, U. C., Routray, A., Mohapatra, M., and Niyogi, D., 2013, Real-time track prediction of tropical cyclones over the North Indian Ocean using the ARW model: J. Appl. Meteor. Climatol., 52, 2476–2492, doi:10.1175/JAMC-D-12-0313.1. Seaman, N. L, Stauffer, D. R., and Lario-Gibbs, A. M., 1995, A multi-scale four-dimensional data assimilation system applied in the San Joaquin Valley during SARMAP, Part I: Modeling design and basic performance characteristics: J. Appl. Meteor., 34, 1739–1761. Skamarock, W. C., Klemp, J. B., Dudhia, J., Gill, D. O., Barker, D. M., Wang, W., and Powers, J. G., 2005, A description of the Advanced Research WRF. Version 2: NCAR Tech. Note NCAR/TN-4681STR, 94 pp. Stauffer, D. R., and Seaman, N. L., 1990, Use of four-dimensional data assimilation in a limited-area mesoscale model, Part I: Experiments with synoptic-scale data: Mon. Wea. Rev., 118, 1250–1277. Stauffer, D. R., and Seaman, N. L., 1994, Multi-scale four dimensional data assimilation: J. Appl. Meteor., 33, 416–434. Stauffer, D. R., Seaman, N. L., and Binkowski, F. S., 1991, Use of four-dimensional data assimilation in a limited-area mesoscale model, Part II: Effects of data assimilation within the planetary boundary layer: Mon. Wea. Rev., 119, 734–754. Talagrand, O., 1997, Assimilation of observations, an introduction: J. Met. Soc. Japan Special Issue, 75, 1B, 191–209. Warner, T. T., 2011, Numerical Weather and Climate Prediction: Cambridge University Press, Cambridge, 550 pp. Wheatley, D., and Stensrud, D., 2010, The impact of assimilating surface pressure observations on severe weather events in a WRF mesoscale system: Mon. Wea. Rev., 138, 1673–1694. GovindankuttyAffiliated withDepartment of Physics and Meteorology, Indian Institute of Technology, M., and Chandrasekar,Affiliated withDepartment of Earth and Space Sciences, Indian Institute of Space Science and Technology Email author A., 2011, Impact of assimilation of ATOVS temperature and humidity and SSM/I total precipitable water on the simulation of monsoon depression: Natural Hazards, 59(3), 1647–1669. Srinivas, C. V.Affiliated withRadiological Safety Division, Safety Group, Indira Gandhi Centre for Atomic Research Email author, Yesubabu, V., Hari Prasad, K. B. R. R., Venkatraman, B., and Ramakrishna, S. V. S., 2012, Numerical simulation of cyclonic storms FANOOS NARGIS with assimilation of conventional and satellite observations using 3-DVAR: Natural Hazards, 63(2), 867–889.